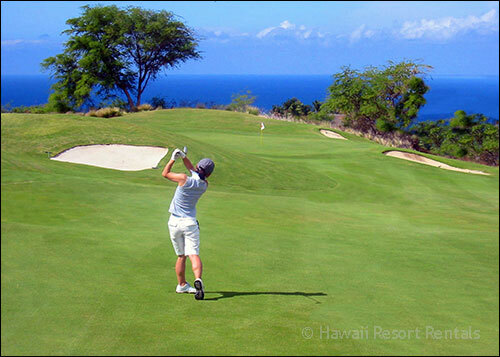 In this golfers' paradise many renowned courses dot Kohala's coast, eight within 20 minutes of us. 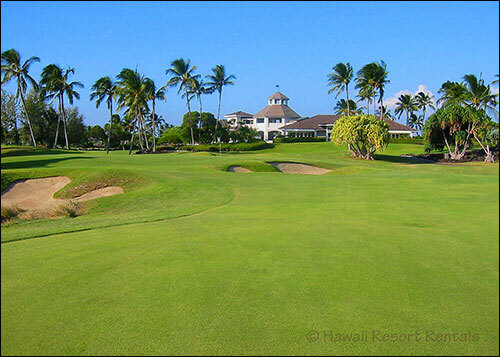 Waikoloa Beach Resort offers two award-winning championship layouts. 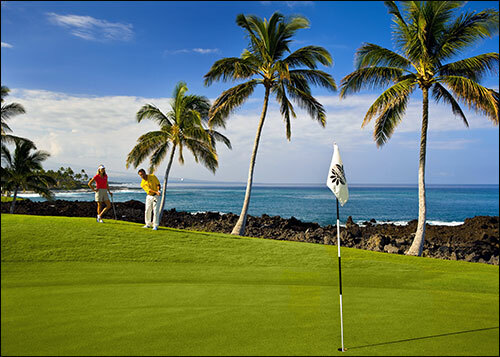 For unforgettable golf experiences play Waikoloa Kings' Golf Course and seaside Waikoloa Beach Golf Course. Hale Pele guests play unlimited golf for $50 - $75 per 18 holes, our Kings' Club golf family membership rate of up to 70% off and rent quality clubs for $25 per round. A cart and full use of the practice facility is included. 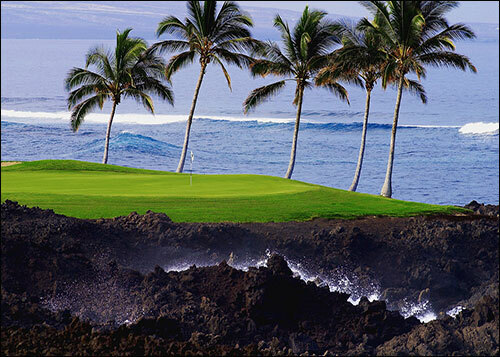 Contact the Golf Shop at 808-886-7888 or see Waikoloa Beach Golf. 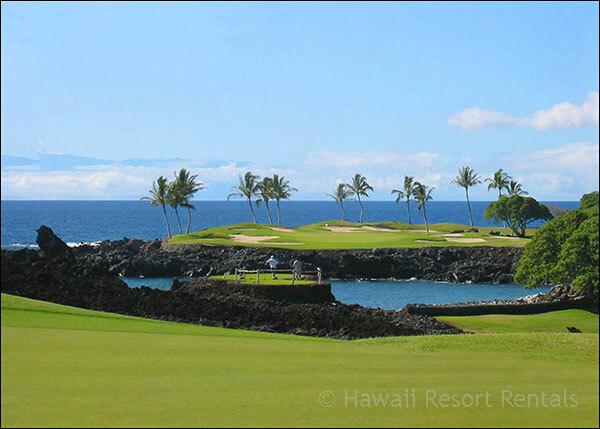 Waikoloa Kings' Golf Course, is an authentic Scottish links course with outstanding views of surrounding volcanoes. Tom Weiskopf and Jay Morrish designed a "player's course" so that low-handicappers may select championship tee-offs for a challenging game, yet beginners will not be intimidated. Picturesque Waikoloa Beach Golf Course is a sporty resort course overlooking the scenic Pacific Ocean and running along the Waikoloa Colony Villas. Hale Pele overlooks the 10th fairway to distant volcanoes, shown with golfers. This par 70 course measures 6566 yards from the tips. Designer Robert Trent, Jr. described it as a unique contrast of Eden-like green grass amid black lava. The beautiful course weaves through white sand bunkers to the surf's edge at the 7th hole. At the clubhouse for both courses a restaurant, gift shop and a driving range and putting greens with practice balls, are available. You'll be treated like royalty at both courses with complimentary round-trip shuttle service if needed. Mai Grille by Chef Allen Hess overlooks Kings' 18th hole and serves breakfast or brunch, lunch, daily happy hour and dinner Thurs. - Sat. Waikoloa Golf Academy's seasoned instructors can help lower your score with classes conducted at Waikoloa Kings Course and Beach Course. Call in advance for private lessons or 9 holes with a pro. 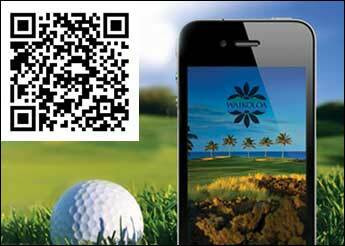 Waikoloa golf courses' app lets you keep score, get GPS yardage markers, make tee times, see live leaderboards and share rounds on Facebook. 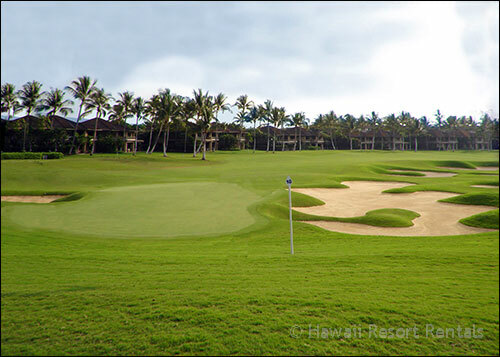 These two championship golf courses, Francis H I'i Brown North and South Golf Courses are set on lava flows with lush greens and magnificent ocean views. Over-the-water shots and stunning scenery make this one of the world's most talked about golf destinations. This fabulous Arnold Palmer and Ed Seay course is built on an ancient lava flow, 6875 yards from the tips with a 73.3 rating. Golfers call it easier than Mauna Kea, but still a terrific challenge. You need to hit it straight, although Arnie left some bail out room on his signature par 5s. This world-famous private course winds over 7100 yards ending at the ocean. About 10 minutes down the coast, it is a regular stop on the Senior Tour. Non-members may play at the club's discretion. 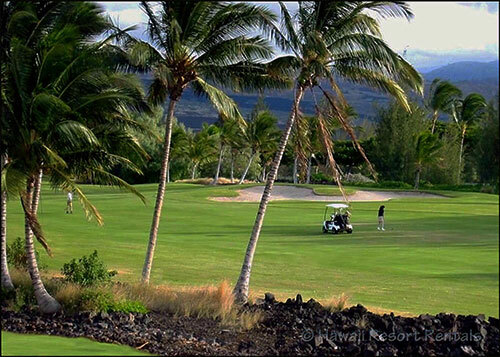 Mauna Kea Golf Course, left, is a great classic course with awesome par 3s that draws raves from golfers. 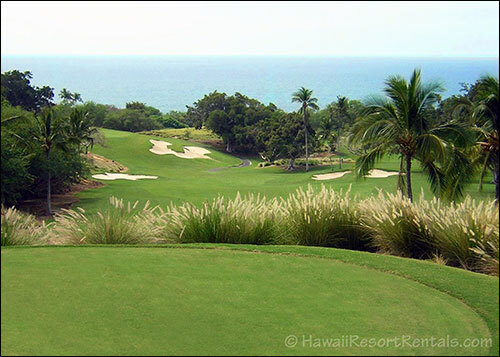 The Robert Trent Jones par 72 is a seaside links course carved out of lava, 15 minutes away. Eight miles inland, Waikoloa Village Golf Course by Trent Jones Jr. is set between snow-capped Mauna Kea and the ocean at 1000 feet above sea level. It has spectacular views from every hole, some dogleg fairways and two lakes.